The good news is there are so many ways to get more Twitter followers—47 of which are listed here. The bad news is that you don’t have all day to do the work. Not to worry! We’ve put together the ultimate resource on how to get Twitter followers. Bookmark this page for reference and come back once a week to tackle one item at a time. We’ve broken these Twitter tips into 5 categories. Use this list to jump straight to each section. Each section includes what to do and step-by-step how to do it. Many sections include bonus resources and tools to help you execute these ideas. So here we go…a deep dive into how to get Twitter followers. Pick out the tasks you’d like to conquer first and copy them to your own private board. Assign it to a teammate, or simply use it as a regular weekly reminder. First things first. You must have your Twitter house in order if you’re gonna invite guests. If you’re serious about getting more Twitter followers, you’ll want to go through this check list below to make sure your profile looks compelling. 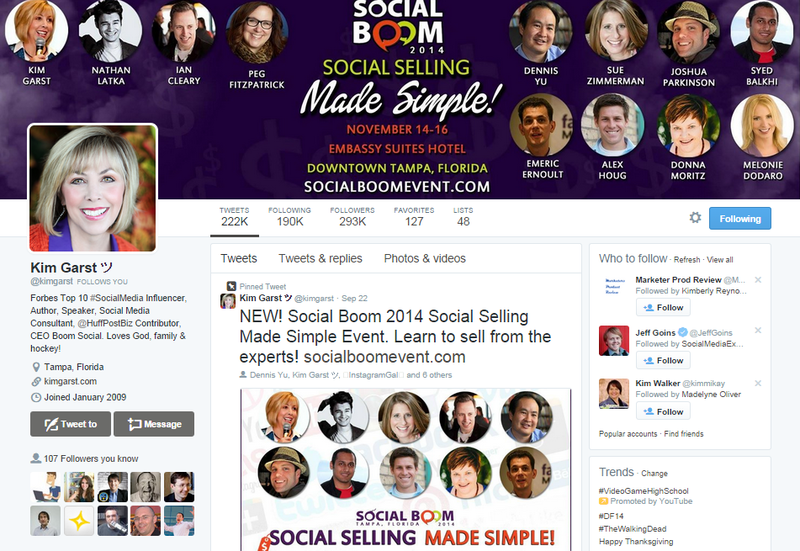 Your cover photo offers prime real estate to sell your business and why people should follow you. The large size of this image gives you the chance to shine, so take advantage of it. Format: JPG, GIF, or PNG. Note: Twitter doesn’t support animated GIFs. Tip: Keep in mind that the design will scale to fit the screen resolution size of whatever device the visitor is on. If you think your audience might visit your Twitter profile from mobile, preview your design on mobile to ensure that all text is legible. The profile photo is what will be seen most often. It’s the image that displays next to your tweets in your followers’ streams. If the Twitter profile you are growing is a brand, you probably want to use your logo. If it’s your personal profile, include a professionally taken photo with a big friendly smile. You can often find low cost photographers through daily deal sites like Groupon, Living Social, and Amazon Local. Tip: Keep in mind that the profile photo your followers will see in their feeds next to your tweets appears much smaller in the feed (73 x 73 pixels) than it does on your profile page. So it shouldn’t have too much detail or text (if any) in the image. Make sure it is legible and recognizable at 73 x 73 pixels, but make the full size 400 x 400 so it’s also clear when people visit your profile page. Your bio is what really tells people who you are, what you know, and gives a sneak peak into your personality. Since Twitter forces you to be concise with a 160 character limit, you’ll have to find a very brief way to get it all in. 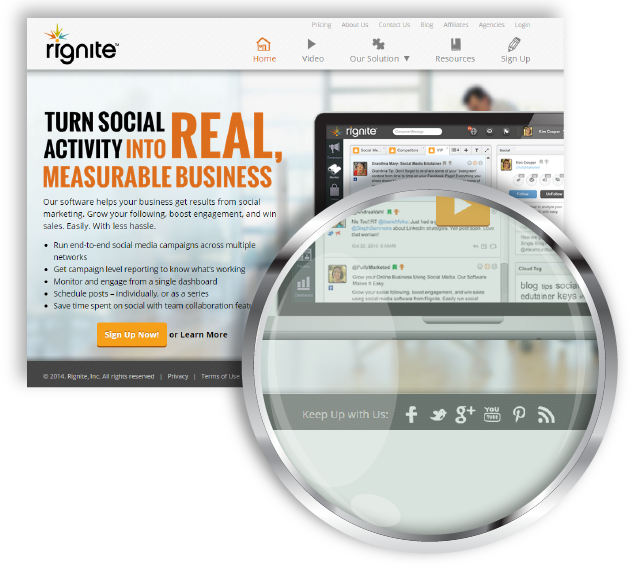 Not only does this make your profile look more visually compelling. It’s also another opportunity to promote a sale, event, ebook, etc. This tweet will stay at the top of your profile regardless of when you tweeted it. So it will be the first tweet people see when they land on your profile. Be sure to use an eye catching image in the tweet. 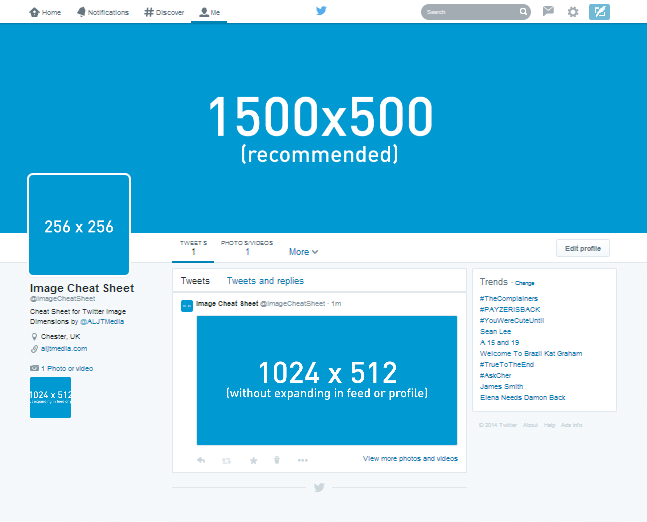 Size: The ideal image size for tweets is 1024 x 512. The image ratio is 2:1 width to height. You can post images with taller proportions. Just keep in mind that Twitter will crop it on center to the 2:1 proportion that shows in the Tweet streams, so make sure any text should be within that centered 2:1 portion of the image. Tools: Canva is a great tool for creating visually compelling graphics. 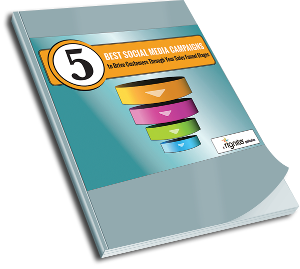 They have templates for all sorts of social media image sizes, including Twitter image posts. There will be more on this topic in Chapter 5. If a potential Twitter follower lands on your profile and doesn’t see any recent tweets, they have no reason to follow you. Keeping an active stream of relevant and interesting content that is true to you and your brand shows visitors what you’re all about and gives them a reason to follow. Schedule content at least a week out in advance. Aim for a minimum of 1 tweet per day, but feel free go crazy with the tweet volume. There’s no shame in tweeting 10x per day if you have the content to back it up. And that content should be a mix of your own content as well as other people’s content. One way to get more mileage out of your own content is to schedule a series of posts every time you publish a blog post. So you’ll have tweets scheduled for months in advance and over time your daily tweets of your own content will stack up. Check out this post on promoting your blog for more tips on how to do this. 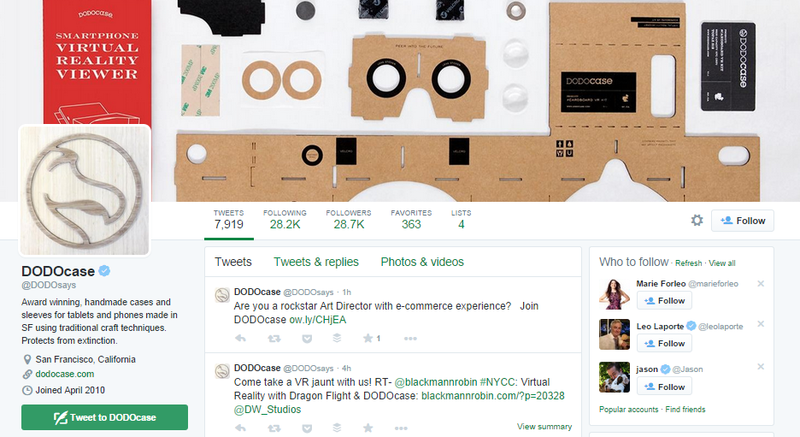 DODOcase captures your curiosity with their intriguing header photo and modern profile pic, but leaves no guesswork in their very clear bio. It’s impossible to land on Martin Katz’s profile and not know what they sell. 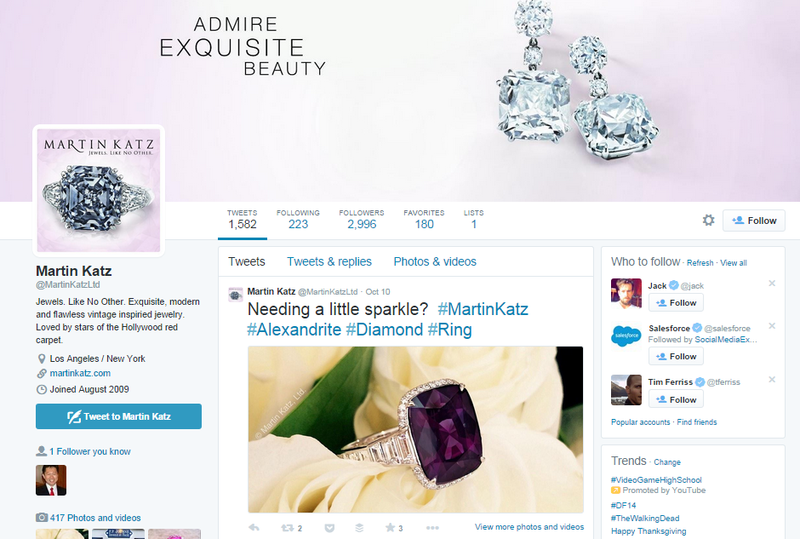 They feature their product bold and beautiful in the header photo, profile photo, and a pinned visual tweet. And the bio is straightforward about what they offer and why you will love it. This is a great example of promoting an upcoming event in both the header photo and the pinned visual tweet at the top of her stream. Now that you’ve got your Twitter house in order, you’re ready to put an invitation to follow—all over the place. The key here is to make it easy for people to follow you from any interaction point they have with your business. This one is obvious, but it’s surprising how many sites make it so hard to find by burying it on the Contact or About pages. 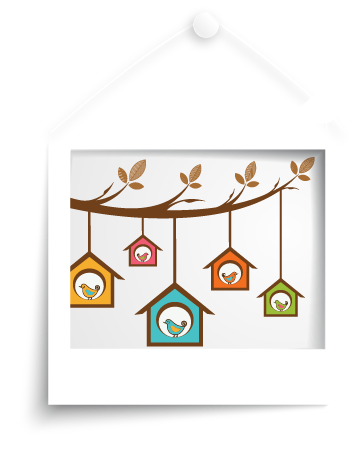 Including a link to your Twitter profile from the header or footer of your site will make it easily accessible. No matter what page a visitor is on when they get the urge to check you out on Twitter, they won’t have to look far to find you. If you are emailing directly with customers, prospects, vendors or anyone really, you have the perfect chance to connect with them further. Display a link to your Twitter handle in your signature so they can easily check out your profile. Since they already have a one-on-one relationship with you, they’ll be likely to follow you. 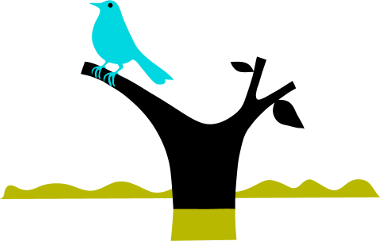 Wisestamp is a great tool for adding your Twitter profile to your email signature. You can even add a button with a call to action to follow you. And you can automatically display your most recent tweet to add even more reason to follow you! Including your Twitter user name in your author bio is important for a couple reasons. Not everyone reads to the end of a post. So when they do, they obviously enjoy your content and would probably be interested in reading more of it. Include a clear call to action to follow you in your bio, so those that truly like your content know how they can continue hearing from you. 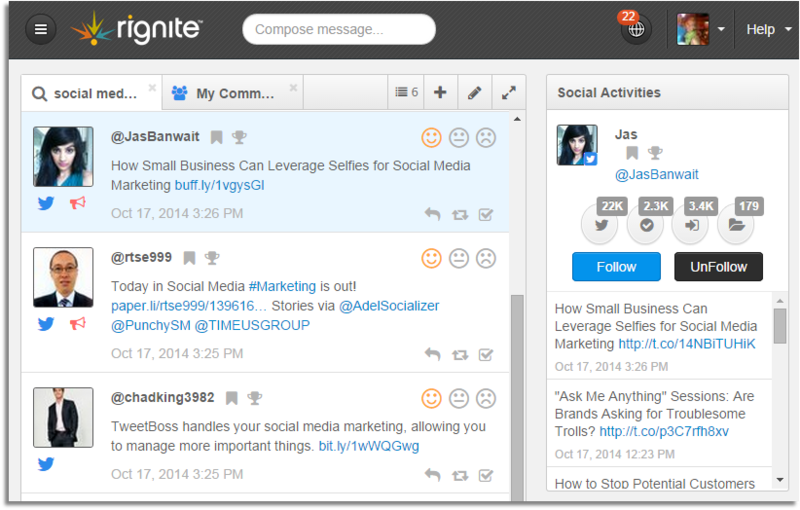 Another reason to include your Twitter handle in your bio is so people can @mention you when they share your posts. This probably goes without saying, especially after the note above. But just as a reminder when you guest post on other sites, make sure you leave a clear path for their readers to take if they’d like to connect with you further and get more of your awesome content. Don’t wait until your blog readers finish the post and hope they read your bio to find ways to connect with you. Add a nice big button with a call to action to follow you, just when your post is reaching a point where you know your reader’s interest will be piqued. 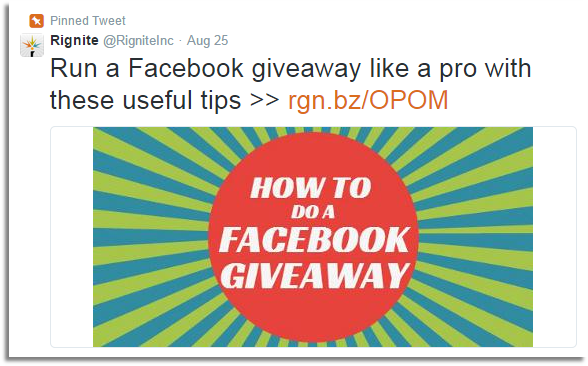 If you’re liking these tips for getting Twitter followers, follow Rignite on Twitter to stay updated when we share more tips and how-tos. Go to this button configuration page on Twitter. Specify the settings you’d like for your button. Copy and paste the snippet of code into your post. Voila! Your readers can now follow you with the click of a button. When someone buys your product or downloads your content, you probably redirect them to a confirmation page. Use this opportunity to take the next step in your relationship. They obviously like something you have to offer, so now give them a clear path to connect with you on Twitter. Like the confirmation page, you probably send confirmation emails after someone makes a transaction of some sort with you. 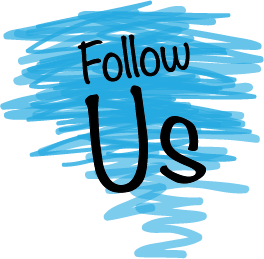 This is another great time to ask your customers or prospects to follow you on Twitter. As you nurture your email list with newsletters or other educational content, include a call to action to stay in touch on Twitter for more great tips. 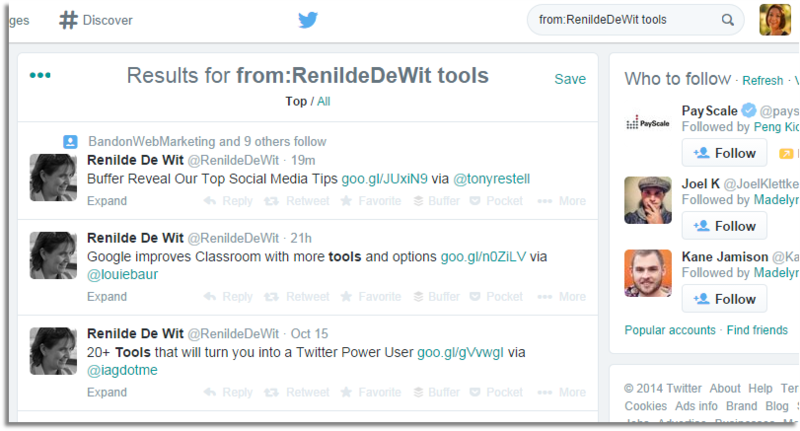 If you run webinars to attract prospects, include your Twitter handle on every slide. Having it on the intro and outro slides is great. But some people trickle in late and you never know when your attendees are gonna get distracted and drop out of the webinar. Don’t wait ‘till the end to tell them where they can find you. While this might seem old fashioned, there’s still a time and place for business cards. Meeting new people in person (gasp!) is still one of the best ways to establish a bond with people. Make sure your business cards make it clear where to follow you on Twitter, so you can take those in-person relationships to the digital realm. If you’re a local business with a store, include signs near the checkout encouraging your patrons to follow you on Twitter. You can sweeten the deal by offering a discount for showing the cashier that they follow you. Or you might say “special Twitter discounts” shared weekly for a more elusive reason to get out their smart phone and follow right then and there. Another tip for local businesses. It’s a nice touch to see businesses using the customer’s receipt as a prompt to follow on Twitter. Why not? They gave you their money, what’s a little follow? Ah, the moment a customer gets that shiny new package is likely to be the time when your customer is most enthralled with your company. Take advantage of their affectionate excitement to be your new customer by including a nice big “Follow us on Twitter” graphic on the packaging. Whether you sponsor events or not, you most likely have some sort of company memorabilia…swag. Don’t slap your logo on your swag and call it a day. That requires people to think, “hey, I should go to Google and search for _____’s Twitter profile and follow them.” That’s unlikely. Include your Twitter user name so they can easily find you if they are interested. Last but not least, make those social connections you have on Facebook, Instagram, Google Plus, LinkedIn, etc count double time by giving them a nudge to also follow you on Twitter. Occasionally post status updates about conversations happening on Twitter. And in your profile descriptions and about sections, include a link to your Twitter profile. Well by “get out”, we don’t really mean out of the house, although that’s a good idea too. Look for people online that fit your ideal follower profile. Then engage with them. It’s as simple as that. 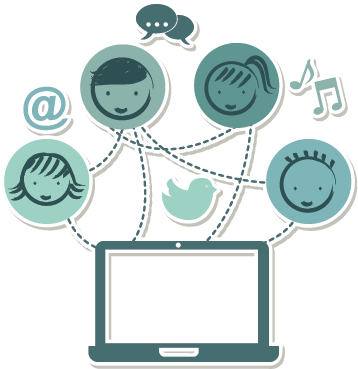 Twitter chats are like virtual meetups to talk about a certain topic. They’re usually held on a regular schedule (e.g. every Tuesday at 9am) and run by a moderator or host. Often times the moderator will post a series of questions and the attendees will reply with their answers which leads to a break out of side conversations. It’s a great opportunity to engage with people who are interested in your area of expertise. And you’ll most likely come away with some new friends and followers. 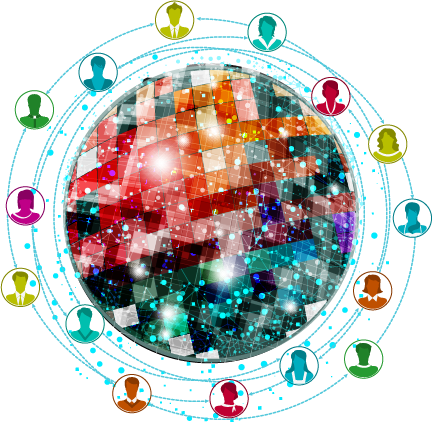 To find a chat that is relevant to your industry check out this list of Twitter chats. Sort by Topic to narrow down the options and see ones that suit you. 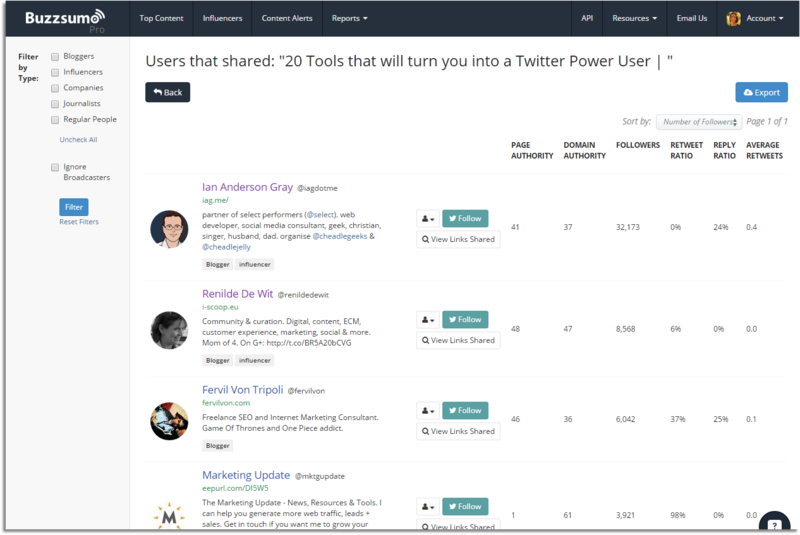 There’s no shortage of tools to help you find people on Twitter. 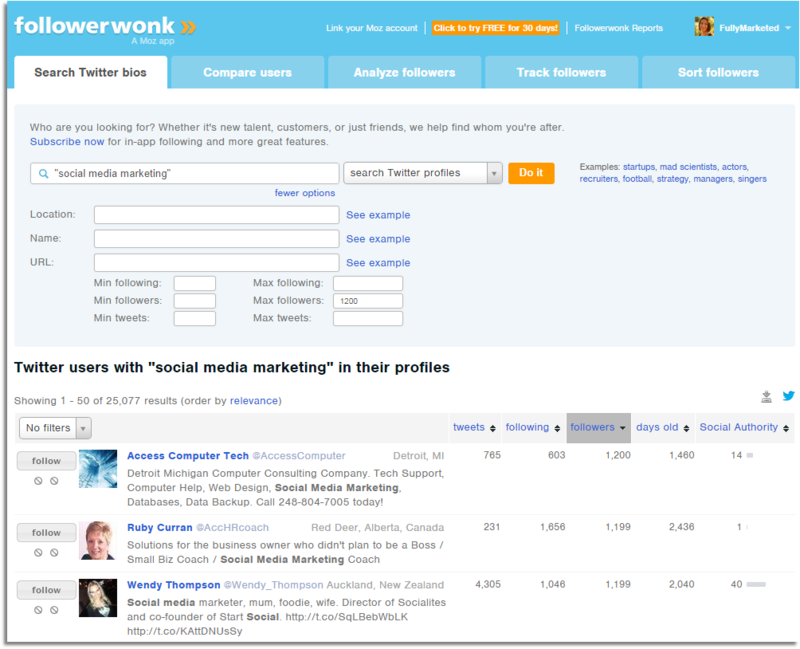 FollowerWonk is a great tool for searching Twitter bios to find people who have your target audience’s interest. There’s an entire list of tools and ways to find people in the section below. We’ll use FollowerWonk for this example because of their search filters and the ability to sort by follower count. 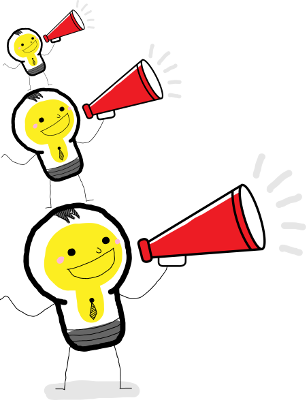 Tip: It’s probably easier to get people to engage and follow you if they are in the mid-tier of influence. Instead of going straight for the big dogs with 10,000+ followers, start by trying to engage those who have around 1,000 followers and work your way up. They clearly have some level of influence and are active on Twitter, but they aren’t the Twitter celebrities who won’t even notice you through all the noise they are getting. Once you’ve found some interesting folks, follow them, retweet some of their posts, go to their blog (if they have one) and share a post or two that you like. Another way to reach out to people with similar interest is to find people who shared an article you really enjoyed and strike up a conversation. 1. Read articles as you usually do. 2. When you find ones you really enjoy, take the URL and paste it into BuzzSumo. You can see a list of people who recently shared that same post by clicking the “View Sharers” button. It’s easier to strike up a conversation with someone when you have something in common. Use the article as a starting point. @RenildeDeWit Loved that article too :) Actually, maybe a little too much. Spent hours today playing around with a bunch of them. Ideally you want to find and reply to the tweet where they shared the article. That will pull up posts from that user that include that keyword. Here’s an example of the search string I used for the post above. You don’t want to use a canned message here and blast it to everyone who shared the article. When they look at your profile, they’ll see you took the same approach with others and it won’t be genuine. So pick only one or two people for each article you read. Then make sure you personalize the message so it’s clearly tailored to them. Do this with very recently published articles. If it’s an old article you might find someone who tweeted it a month ago, which will be untimely to reply to their post a month later. Oh, and don’t forget to follow them. Since you are only tweeting 1 or 2 people for each article, choose those people wisely. I qualify who is likely to engage by looking at their “Reply Ratio.” Go for the ones with the highest ratio. That indicates they will be more likely to respond. To get a little bit more results out of this, click the follow button on all the people who shared the article who look interesting to you. While it’s not as direct as the other approach, they might check out your profile when they get the new follower notification and see that you shared the same article. That will clue them in to the fact that you obviously have similar interests. In those same articles that you find in the step above, chime into the comments section. Reply to people’s comments to engage them directly. And then follow them. Because they’ve just had a conversation with you over the article, they’ll recognize you and will be likely to follow back. This is your standard social media monitoring strategy. Keep a set of search streams in your social media monitoring tool using a broad topic keyword to find public posts about your area of expertise. When you find interesting posts, reply or retweet them, and follow them. Maybe they’ll follow back since you’ve taken the time to engage with their posts. This is a pro tip. Dorie Clark shared this awesome idea in this Forbes article that we had to include in this list. 1. In LinkedIn, go to your connections page and click the gear icon. 2. Export your contacts to a csv file. You can find the export link in the right sidebar. 3. Import those contacts into your email contacts (e.g. Gmail, Outlook, etc). Choose “search contacts” using your email provider. 5. Twitter will find all your contacts on Twitter and give you the option to follow them all in one fell swoop, or pick and choose which ones you want to follow. Since these are all people who know you well enough to be connected on LinkedIn, you are highly likely to get a follow back. 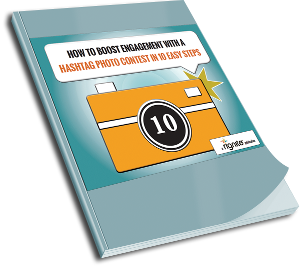 It’s hard enough work to grow your following and boost engagement on Twitter. So when you do get a mention, retweet, or a share of your blog posts, be sure to take the time to thank them. In this article, Nicole Kohler shares an experiment she ran that proved gratitude boosts your following. The result: 26% of the people she thanked followed her. Mindlessly sending the same “thanks for sharing” tweet to everyone who shares your content will lose its oomph when it’s seen over and over again in your stream. The benefit of showing appreciation when people engage with you is that it makes them feel good. But who feels good when they see they’re just one of many others who get the same message? Get creative and personal with your thank you. Use it as an opportunity to show genuine interest in something about them. There is a common thread of advice that seems to apply to all of life. Put out into the universe what you want in return. In the Twitter universe, that means follow people you’d like to have follow back. If there’s a clear common interest between you and the people you follow, there’s a good chance they’ll follow back. Which leads us to the next tip. 1. Carve out about 15-30 minutes a week and go on a following spree. Don’t you ever have those times during your work week when you hit a lull in your stride? This tip can be a great lightweight task to do when you feel like you just can’t do any heavy lifting. 2. Using the tips and tools mentioned below, find people and follow them. As many as you can fit into your block of time. 3. Then the following week, unfollow the people who didn’t follow you back. And go on another following bender. You can easily see who hasn’t followed you back using Just Unfollow or ManageFlitter. Go through your followers’ followers’ and follow them. Tongue twister? Let’s try it another way. Go to your list of followers. Click on one of their profiles. Then click to see their list of followers. Go through that list and follow anyone who looks relevant to you. When they see that you’ve followed them, they’ll see that you are also followed by “so-n-so” which adds a bit of social proof. Go to your competitor’s profile. Check out their list of followers and follow the ones that look relevant. It does take some time to figure out that John Doe on G+ is @JDoe on Twitter. But the response rate is likely to be very high considering they already know and follow you elsewhere. Here’s a pro tip that was brought to our attention by John Janney. As an alternative to following thousands of people, curate Twitter lists of experts, gurus, head honchos in your industry, etc. The benefit to this strategy is that you won’t have to worry about your following-to-follower ratio getting out of whack. And your Twitter stream won’t be as cluttered with Tweets from following so many people. Well tweet me if you haven’t heard this nugget of advice (yeah…that’s sarcasm). This is easier said than done. You can tweet until you’re blue in the beak and get no reaction. So we’ve put together these tips to help your tweets get traction. Hashtags can be used for a slew of purposes. For the purpose of growing your Twitter following, you’ll want to “tag” your posts with a popular hashtag that people in your target audience are likely to follow. This helps your tweets get discovered by people who follow that hashtag. 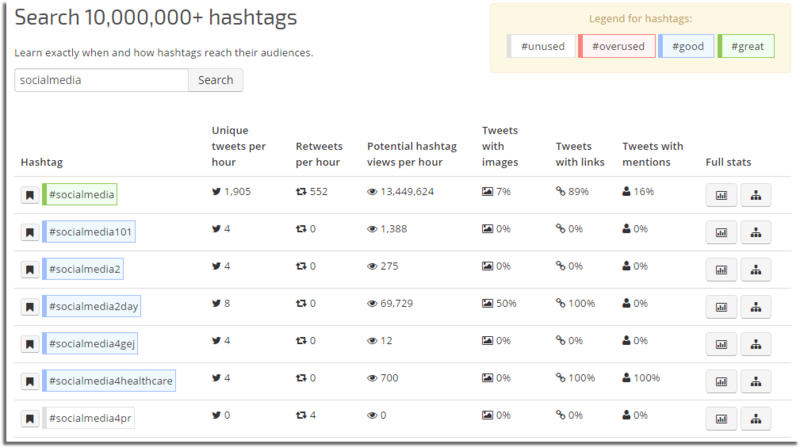 RiteTag is a great tool to help you find which hashtags to use in your posts. 2. You’ll see a list of potential hashtags, each one color coded based on how opportune it is. You’ll probably want to stay away from unusued and overused hashtags if your goal is to get your tweets discovered. Aim for tweets that are labeled either good or great. You’ve probably been to a party or networking event where you got stuck with someone who was giving you a monologue, talking and talking without engaging you in a two-way dialogue. Don’t be that person on Twitter. Posing a question is a great prompt to your followers to respond and open up a two-way (or many-way) conversation. On the flip side of asking questions, you should also look for opportunities to answer questions posed by others who are seeking advice in your area of expertise. In the same way you search Google, you can get creative with your search strings when monitoring Twitter for questions. Including the ? helps you narrow in on questions. Including the –http will exclude tweets that have a link. Those are usually just people sharing articles. This is one of the most effective types of content to tweet, and the best part is that it’s so easy to create. In about an hour of time, you can schedule a month’s worth of inspirational quotes. You can also do Google searches to find more sources about topics that are relevant to your industry. Tip: Choose short quotes that will fit in a 117 character tweet with the author citation. When you attach the image that will take up about 23 of your allotted 140 characters. Canva is a great tool for creating graphics. They have many pre-designed templates that are easily editable. So you can change the font, the text, the colors, and the background image. You can search for background images within Canva, but you can also download stock photos from other sites and upload into Canva. This is a strategy that Twitter recommends. Tease your followers with a special offer that will get unlocked after your post has been retweeted ____ times. Make it clear that you only share special offers on Twitter. That might be coupons, discounts, first look at new products, whatever floats your audience’s boat. 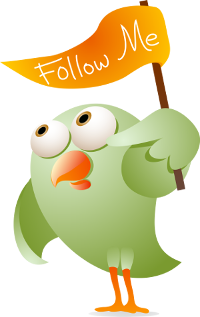 Now that you’re armed with all the best tips for getting more followers, go out there and knock ’em dead champ!